Thursday was a boring session for the S&P 500 as it did a lot of nothing and finished exactly flat. But boring is good. Bear markets are filled with emotion and volatility. They move so fast people don’t have time to think or make rational trading decisions. Contrast that with this market where we barely moved 10 points in a week. The most dramatic move occurred Tuesday after Trump revived trade war fears when he threatened Europe with new tariffs. But that 0.6% loss failed to build momentum and the next two days finished green. Two days later and Tuesday’s bearish headlines and market dip are long forgotten. 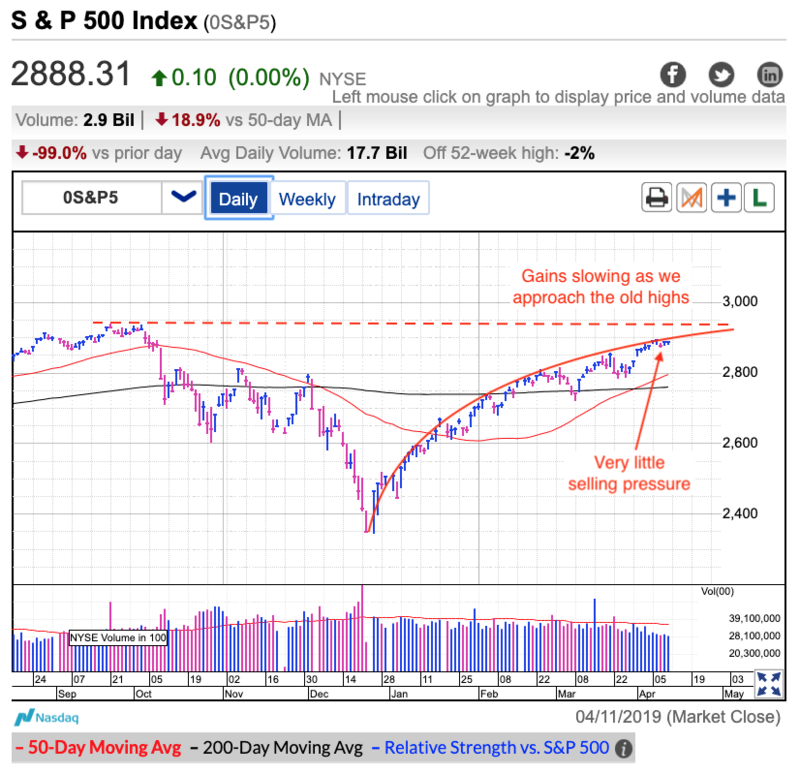 If this market was overbought, fragile, and vulnerable to collapse, Tuesday’s headlines and dip were more than enough to kick off an avalanche of selling. The fact prices held up tells us the ground under our feet is solid and there is a lot of support at these prices. This continues to be a strong market and the path of least resistance remains higher. That said, we burned through a lot of demand since the start of the year and it is no surprise the rate of gains is slowing. We are quickly transitioning to more sideways than up as we approach the old highs. That means we need to be patient and expect a little more back-and-forth. Down days like Tuesday are a normal and healthy part of every move higher. Resist the urge to assume every day’s gyration means something. Most of the time the market’s moves are meaningless noise. Yet that doesn’t stop people from predicting every up-day is the start of the next surge higher and any dip lower is the beginning of the next collapse. As I said, if this market was going to collapse, it would have happened by now. But at the same time, the rate of gains definitely slowing. Combine these two ideas and we have a market that is doing a lot of nothing. It is okay to keep holding our favorite buy-and-hold investments, but for a trade, there isn’t much to do. We want to trade when the odds and risk/reward are stacked in our favor. We want to trade when the market is handing out money. But a lot of the time, the smartest trade is to not trade. Holding risk of the unexpected for a 10-point profit over a week is simply not worth it. We only want to own stocks when we are getting paid and right now the market is being stingy. Better trading opportunities are coming, we just have to be patient. Until then, don’t let these meaningless gyrations fool you into making poorly timed trades. Note: The above only applies to short-term trades. This market is acting well and there is nothing to do with our favorite buy-and-hold investments expect sit on them and patiently wait for the profits come to us.